Four cassettes: $59.95 plus $6.95 for shipping and handling; total running time approximately four hours [VHS format only]. Available from: A&E Home Video, P.O. Box 2284, South Burlington, VT 05407-2284, U.S.A. Tel. : 1- 708-1776. The video Four Years of Thunder is highly recommended to anyone with an interest in the development of early aviation or who simply enjoys seeing aircraft of the Great War in flight. Originally screened on The History Channel in September, 1996 on cable television in the United States, this four-part series traces the growth of military aviation from the days of the Wright brothers through the end of the First World War. It does this by skillfully combining vintage black-and-white film clips with color film of historic and replica aircraft at the Old Rhinebeck Aerodrome museum and airshows. These are integrated with scenes of the ground fighting during the Great War and views of how such sites as the Marne and Somme appear today. The producers have succeeded admirably in relating the glamorous fighter aces and aircraft usually featured in films of the Great War to the broader aviation context which included observation, artillery spotting, and bombing, as well as the use of airships and flying boats. Further, they indicate how military aviation functioned with respect to the still broader context of the ground fighting which ultimately determined the war’s outcome. Four Years of Thunder was written, produced and directed by John Honey. Walter J. Boyne, the well-known aviation author and former director of the National Air and Space Museum, Washington, DC, served as an associate producer and historical consultant for the series. Other names listed in the credits will also be familiar to many viewers. Volume I: Flying to War, Beginning of Flight to end of 1914 - states that the objective of the video is to relate the "story of how military aviation, in less than a decade, grew from a vague theory to a comprehensive system of warfare." The uses of military aviation in Mexico and Libya before 1914 are cited early in this first cassette. It includes what is believed to be the first motion-picture filmed from an aircraft and one of the first parachute jumps from a heavier-than -air craft. Among the personalities to be seen are the Wright brothers, Glenn Curtiss, Albert Santos-Dumont, Henri Farman, Louis Bleriot, Roland Garos, Anthony Fokker, Count Von Zeppelin, and other aviators. Dignitaries and military men shown, among others, are: Archduke Franz Ferdinand at Sarajevo, Kaiser Wilhelm II, General Kitchener, General Gallieni, and Generals Joffre and Foch. Aircraft at least glimpsed include: early Wright Flyers; a 1909 Antoinette unsuccessfully attempting a crossing of the English Channel; a Bleriot XI, a Curtiss D demonstrating its control system, a French Hanriot; a Taube monoplane, German rigid airships; Maurice Farman Longhorn and Shorthorn, and an AVRO 504. These scenes are blended with ground-level footage of some pre-war aviation highlights, the Archduke’s funeral, mobilization of the armies, troops attacking and retreating, battle scenes, taxicabs transporting French soldiers from Paris to the Marne, and trenches under snow. 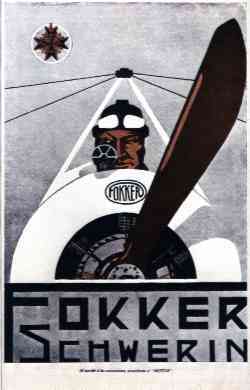 Volume II: The Fokker Scourge 1915-1916 - By 1915 the technology race was in full swing and is illustrated here with such developments as Roland Garos with a deflector plate fitted to the propeller of his Morane-Saulnier N countered by the first real fighter - the Fokker Eindecker - with its synchronized machine-gun firing through the propeller arc. First one side then the other secured a temporary advantage thanks to new equipment. Other film clips show: Bristol Scouts, Nieuport 11s, aerial acrobatics, pilot testing and training using "penguins", Caudron G-3 and G-4 early bombing efforts, Voisin biplanes, scenes of aircraft manufacture, German and French troops at Verdun, General Petain, trucks moving along the "Sacred Way", the use of poison gas and flame-throwers, and a Rumpler two-seater. The Rumpler had a camera mounted between its wing struts and produced what appears to be genuine operational footage. There are also scenes of balloons and balloon-busting rockets being mounted on wing struts, the elite French fighter squadron "Les Cigognes", Nieuport 17s, Fokker E-3, Farman F40s and such aces as Georges Guynemer, Max Immelmann, and Oswald Boelcke. Also featured are the American flyers of the Lafayette Escadrille, whose numbers were small but whose influence on America’s entry into the war was great. Views of British troops attacking on the Somme in July, 1916 are related to the scenes of the arrival at St. Omer of FE 2ds and DH 2s from England, helping gain air superiority for that offensive. This volume concludes with film of the Spad VII and the entry into the war of a new German fighter; the Albatross. Volume III: Bloody April 1917-1918 - Included in this cassette are views of: the Sopwith one-and-a-half strutter, the FE-2, WRAF women engaged in aircraft construction, Lewis guns and Scarf rings. On the German side we see: Hindenburg and Ludendorff, Boelcke and Richthofen, and construction of the Albatross. Sounds of engines running, hammers tapping, machine guns firing, have been smoothly and effectively added to the originally silent films. Rare film of an Albatross attacking a much slower Caudron biplane can be seen. Sopwith Pups, DH-2s, SE-5s, Sopwith Triplanes, Handley-Page bombers, Charles Nungesser, Rene Fonck, and a simulated dogfight between a Fokker DR-1 and a Sopwith Pup are also included here. Adding to the realistic impression of the film taken at Old Rhinebeck are the use of vintage cars and motorcycles and the period dress of the recreators portraying pilots, mechanics, and bystanders. Black and white film taken of the results of the original dogfight [won by Richthofen] show Richthofen and Fokker examining the remains of the shot down Pup. Original footage of the Bristol F-2b and AVRO 504 taken in Palestine, the Sopwith Camel, the death and funeral with full honors of Manfred Richthofen, and a look at his successor, Hermann Goering, conclude Volume III. Volume IV: Winged Victory 1918 - Featured in this final volume are the Americans and the planes in which they trained and fought [Curtiss JN-4, DH-4, Nieuport 28, Sopwith Camels, and Spad XIII]. The delays which occurred in providing them with the necessary aircraft, engines and armament are well described. Also covered are Germany’s "America Program" designed to increase aircraft production to 2,000 planes a month and the formation of Britain’s Royal Air Force through the combining of the RFC and RNAS. Other film clips include: the funeral of Raoul Lufbery, aircraft, Liberty engine, and hangar construction scenes, pilot training, the Felixstowe flying boat, shipboard launchings of patrol planes, Handley Page bombers, the Fokker DVII and DVIII, French Salmsons and Breguets, and Italian Capronis]. Perhaps the highlight of this final cassette is the story of how air power was used in multiple ways in close coordination with ground troops in the St. Mihiel offensive. Involved were 1,481 aircraft of 15 different types, and 101 squadrons made up of French, American, British, and Italian units. The logistics were horrendous but the result was successful. In the Paris victory parade shown in the video a pilot, irked at the lack of representation of the air services in the parade, can be seen flying his biplane through the Arc de Triomphe! He made his point. The final year of the war had reinforced the belief of all major powers that aircraft had become crucial in supporting armies on the battlefield. "The speed of technological development over four years had been dramatic ... a great new industry - aviation - had been established [and] the world was captivated by its excitement and boundless possibilities."